Late lunch today…but there is a method to my madness. Also, it’s way too early/late in the day to go do my favorite snow day activity: drinking hot chocolate spiked with liquor, watching the snow falling in my pajamas. So, today’s Friday in the workweek, and it’s the next best thing. Today, I ordered chicken tenders deluxe, including a side salad and French fries, with a honey mustard sauce on the side. 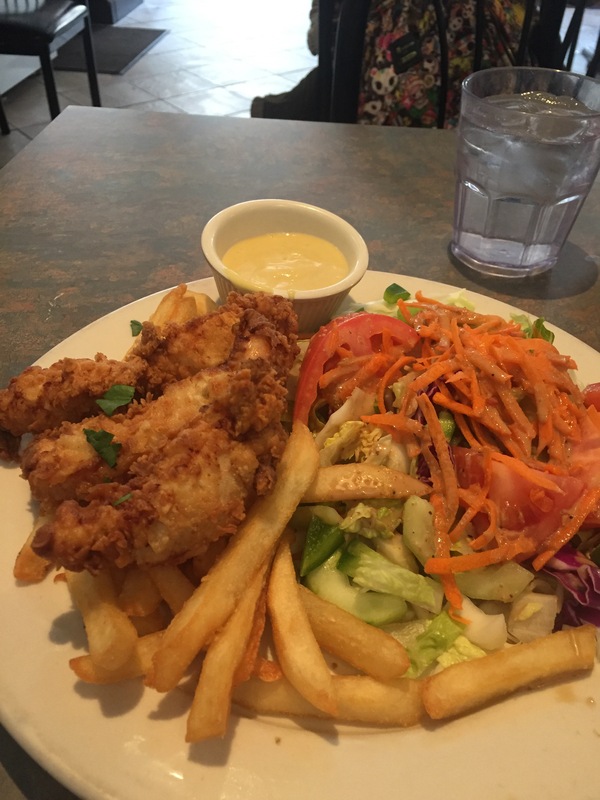 Amazingly, the plate was not overtly ample, and both the fries and chicken were freshly fried, so they were still good and warm.The side salad, was full of roughage, and was just okay. (I did like the vinegarette though; it was light and pleasing to the palette).